Avocado, so easy to grow with a few tricks. This fruit tree would have to be the one that gives Silvia and I the most questions of all the 700 vars we sell in our little nursery, so many half truths are espoused on TV or blogs and webpages, while all this info could be useful it often misses vital explanation of when and to who it is appropriate information. I have been bringing these trees down to Melbourne (high up in the hills at Olinda) for nearly 20 years now, and yes I killed a few, but only because they were growing in pots (usually still in the nursery). I have found that the practices of Permaculture and Biodynamics have given me the grounding to ask the right questions of nature and look to harder, as both disciplines are based on “Observation”. I find long term observation over many years and seasons to be the most useful rather than a short term scientific experiment. Water needs; how to manage this easily. How they pollinate their fruit: A vs B sets. The 12 varieties we grow; what are they like. 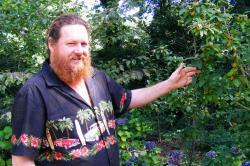 Myths, misinformation & other observations from our sub-tropic food forest. For all fruit trees the first thing to do is see if they grow well in your area without any help. This can be achieved by asking people in your area (try a local permie group, garden group or transition towns/ community). I like to drive around a new area and see what is growing over fences – in particular look for rental houses, or ones where garden and lawn are neglected – then look at the trees to see if they look healthy. Otherwise you need to create the conditions it likes by locating correctly or creating a microclimate to meet those conditions. Avocado does not need lots of extra work – just good placement when planted. It is said an avocado will grow anywhere a camellia will grow, this is true but it will grow in a far greater climate than that. It really has three needs to be successful: protection from the cold winds (for Melbourne this is normally from the south west), good drainage (just like a citrus – this applies to any sub tropical tree), and adequate water. First identify where it comes from or does well, and those conditions. It grows well in NSW up to Qld along the coastline where good rain occurs over summer, and falls onto deep forest litter which stops it evaporating. It sits as an understory tree in the forest so is often not in direct sunlight all day. The large leaves tell you it has good solar collection in lower light. The darker the green, the more shade a plant can usually tolerate (my observation is that in Melbourne we give it more open direct sun, and so the leaves are a much lighter green in colour compared to NSW/Qld border plants). same time, this does not happen in Melbourne over summer. Ideal location is north east of a building or dense trees this means it gets the cooler morning sun and not the hot west sun in summer. Create high humidity and higher overnight temperatures by using walls and closing it in, say between a shed/house and the fence, sunlight is required at top of tree not at the trunk. This means an avocado can go into a spot on your block that is a problem for all the other regular fruits that get fungal problems when closed in. This may mean the tree goes down the back in a dead spot you were forced to create with town planning, such as a shed 1.2mtrs from fence this will fit a few trees as it will normally be 6mtrs deep so 2 avocados plus maybe a Macadamia. If the shed is flat to ground then find some second hand flat roof iron (about 14”- 400mm wide and run it down against the shed tin and the neighbors fence – this can then be made deep with straw and other organic matter. It can even be used as a compost area. An avocado would prefer a neutral to more acid soil (which is almost all our soils) as these are created by high rainfall leaching the limestone from them. A forest will be quite neural in its top mulch layer, and will have very little erosion and perfect drainage, so this is what you need to create if your soil is heavy (clay). First do the normal percolation test: just dig a hole and pour in a bucket of water – if it’s not all gone in 15 mins then you will need to build up the soil. So dig the biggest hole you can then add organic matter (mushroom compost is cheap and useful here), mix the new material with the old from the hole and build it up so the base of pot is level with old soil at least ( water soil in well so it levels quicker) then put tree at this level, build soil up with more of the mix you made. Avocado like many fruit & nut trees that require deep soils are susceptible to Phytophthora. This becomes an issue in waterlogged soil rotting out the roots hence the need for good drainage. Water loss is one of the most critical things for an avocado – once in the ground and mulched they are very hardy (ours have yearly snows on them and went thru the record 46.5C with out issues), but the potted ones had trays under and were watered twice. They lost all their leaves and we had 3 months of trying to save them – ultimately we lost half of those Hass. I recommend a full bale of cheap straw per tree per year for a start and then grow something like strawberries under them if they are in good sun, or keep putting any mulch material from the garden under them when you have to get rid of it. They don’t like their roots disturbed, so don’t plant in chook runs as they will scratch up the surface roots too much; they like permanent mulch. Let branches grow to the ground to help reduce evaporation, and consider a water system or give a good water every 3-4 weeks over summer months (Jan – April). *Grey water could be very helpful but watch it’s PH to ensure that it is not to alkaline. Soil PH of 5.0-5.5 is preferred. I do not recommend you prune an avocado unless you have to, labels that display a size of tree are set to sub tropical conditions, my experience is that they get to half that height here at my place. I have seen a Hass avocado 20 years ago ravaged by goats and it was all misshapen and only 2.4 mts tall with 200 fruit on it in the south of a building near Beaconsfield, then Silvia says the one at Louis Glowinski’s place in Caulfield covers the driveway, not sure what the variety is, in Olinda our 12 vars varieties growing vary from 2mtr to 5 mtr tall. * Don’t feed any avocado prunings to animals, as they are reported to be poisonous. The same applies to the seed and the bark of the tree. I have found issues if pruning an avocado as they are susceptible to fungal attack when cut, so clean sharp secateurs and cutting at the right time are important. This is where biodynamics comes in: my observations have been to cut only when the moons pull on fluids is upward and outward – that is when the moon gets closer to earth in its monthly cycle and exerts a stronger pull on all fluids, so this is the ascending cycle that runs for about 2 weeks. It is also noted as the time for spraying 501 or for grafting, it is the opposite 2 weeks to when you are normally told to prune other fruits, it has nothing to do with full and new moon although if it coincides with a full moon the influence is stronger ( ie: when you get King tides). Don’t grow the tree by exposing the trunk, its better to leave branches bend to the ground, as a bare trunk will get sunburnt when we plant them in more sun down south, up north commercial growers who want to use machinery harvest have to paint the trunk white to stop the sunburn. The avocado is unusual in that the timing of the male and female flower phases differs among cultivars. There are two flowering types, “A” and “B”. “A” cultivar flowers open as female on the morning of the first day and close in late morning or early afternoon. Then they open as male in the afternoon of the second day. “B” varieties open as female on the afternoon of the first day, close in late afternoon and reopen as male the following morning. Pollination is not by bees but by blowfly’s in my experience and when in full flower (King flower) it smells like rotting meat up close. As you can see the A or B set “alone” will not pollinate itself in normal warm conditions. But it’s my opinion in cooler conditions the flowering gets delayed in the transition from female to male flowers and this therefore allows partial self fertilization to occur. 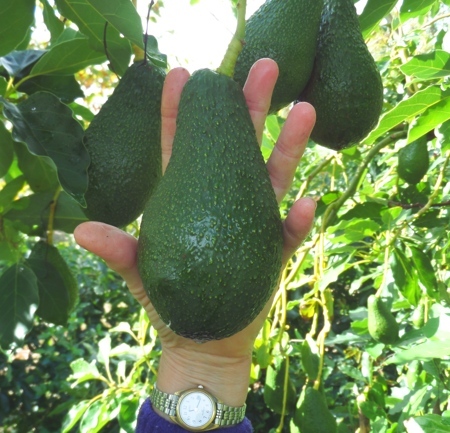 So we expect 80 to 100 fruits in Melbourne on any single avocado, but if we have one from each set then after a few days both sequences will have male and female together and produce 250-300 fruit on each. They will need to be close enough for the flies to transfer pollen from one tree to the other so in the same yard or just next door with neighbors), but unlike the bee-pollinated plums & apples they will not get flies going up to 5 miles to find another tree. “Cukes” are small crescent shaped avocado fruits with no seed inside due to miss pollination, they are present in small numbers at the same time as the normal fruit on the tree, these are sold in shops sometimes as Cocktail avocados. ( so far I have only seen Fuerte produce these). See “harvesting” later in article for info on why to pick all fruit in a quicker time period (20 weeks). Summary of the ones I have planted so far at Olinda over last 18 years. for 80% of cultivated avocados in the world. Hass trees have medium-sized (150–250 g or 5.3–8.8 oz), ovate fruit with a black, pebbled skin. The flesh has a nutty, rich flavor with 19% oil. A hybrid Guatemalan type can withstand temperatures to −1 °C (30 °F). The Gwen is a seedling bred from Hass x Thille in 1982, Gwen is higher yielding and more dwarfing than Hass but is a registered variety in Australia only available to commercial growers, and the fruit is sold in shops as Hass. The fruit has an oval shape, slightly smaller than Hass (100–200 g or 3.5–7.1 oz), with a rich, nutty flavor. The skin texture is more finely pebbled than Hass, and is dull green when ripe. It is frost-hardy down to −1 °C (30 °F). 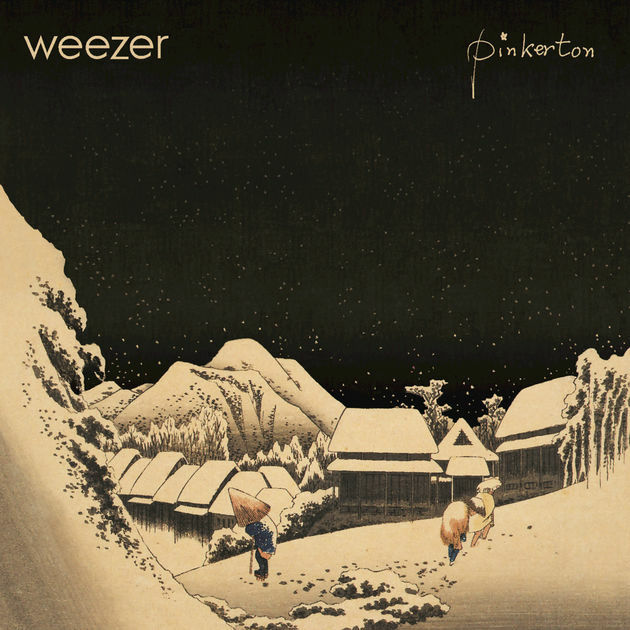 First grown in California in the early 1970s, Pinkerton is a seedling of Rincon. The large fruit has a small seed, and its green skin deepens in color as it ripens. The thick flesh has a smooth, creamy texture, pale green color, good flavor and high oil content. It shows some cold tolerance, to −1 °C (30 °F) and bears consistently heavy crops. A hybrid Guatemalan type, it has excellent peeling characteristics. The Reed ame from a chance seedling found in 1948 by James S. Reed in California, Reed has large, round, green fruit with a smooth texture and dark, thick, glossy skin. Smooth and delicate, the flesh has a slightly nutty flavor. The skin ripens green. A Guatemalan type, it is hardy to −1 °C (30 °F). Tree size is about 5 by 4 meters (16.4 by 13.1 ft). The Wurtz is the only true dwarf cultivar. It grows 2m x2m ( 6”x6”) and is the only one that should be planted in a very large tub the size of at least a large half wine barrel ( the 500ltr size). Tt has a smooth skinned pear shape fruit which is easy to peel. matures July – October and weighs approximately 300gms. It is used to pollinate Fuerte in commercial plantings. The tree has a 6m spread and 4m height. Very similar to Hass except that it matures 4-12 weeks later. Dark purple coloured fruit. Developed by farmer James Bacon in 1954, the Bacon has small-medium sized fruit with smooth, green skin with yellow-green, light tasting flesh. When ripe, the skin remains green but darkens slightly, and fruit yields to gentle pressure. It is cold-hardy down to −5 °C (23 °F). this one has been talked about on TV in Australia so has been the most requested of late, if you want to try the fruit look for small bags of fruit marked down cheap in the shops, they have a large pip to flesh ratio so for me are possibly the last avocado I would plant at home – unless if was for a windbreak for the others such as a commercial A type crop such as Hass or Gwen. A Mexican/Guatemalan cross, the Fuerte earned its name (meaning strong in Spanish), after it withstood a severe frost in California in 1913. Hardy to −3 °C (27 °F), it has medium-sized, pear-shaped fruit with a green, leathery, easy to peel skin. The creamy flesh of mild and rich flavour has 18% oil. The skin ripens green. Tree size is 6 by 4 meters (19.7 by 13.1 ft). This variety is substituted with 3 others in the stores of Australia, Sharwil, Ryan & other pear shaped fruit. This variety also forms the Cukes or cocktail avocados. Predominantly Guatemalan, with some Mexican race genes, Sharwil was selected in 1951 by Sir Frank Sharpe in Southern Qld. The name “Sharwil” is an amalgamation of Sharp and Wilson (J.C. Wilson being the first propagator). Scions were sent from Australia to Hawaii in 1966. A medium-sized fruit with rough green skin, it closely resembles the Fuerte, but is slightly more oval in shape. The fruit has greenish-yellow flesh with a rich, nutty flavor and high oil content (20–24%), and a small seed. The skin is green when ripe. It represents more than 57% of the commercial farming in Hawaii, and represents up to 20% of all avocados grown in NSW, It is a regular and moderate bearer with excellent quality fruit, but is sensitive to frost. Disease and pest resistance are superior to Fuerte. This variety pollinates Rincon and Hass and is particularly suited to coastal regions. An upright spreading tree with green skinned smooth pear shaped fruit. The fruit weights approx 300gms, maturing November – January. The tree has a 6m spread, 8m height and a flower type of B. It is used to pollinate Gwen in commercial plantings. A small to medium pear-shaped fruit with thick, green skin that peels easily. The fruit has an excellent flavour, medium oil content and does not turn brown when cut. The tree has a spreading habit and is a high yielding. It displays good resistance to frost and anthracnose. This is our major rootstock used in Australia for home gardeners as it has a good tolerance of lime and salt. More Varieties I wish to trial here in Olinda once I can get a tree to plant. An upright growth habit, with a glossy green pear shaped fruit, weighing approximately 300-400gms. The flesh texture is very good. It is used to pollinate Fuerte and Hass in South Africa. Its flower type B. It matures August – October, and the tree has a 3m spread and 9m height. Is a compact upright grower with pebbly green coloured skin. Fruit is pear shaped weighing approximately 0.45kg. The fruit matures September – December. The tree is susceptible to zinc deficiency and is as frost tolerant as Hass. The tree has a 4m spread, 4m height and a flower type of A. Is a vigorous upright growing tree, with smooth skinned green pear shaped fruit. Maturing April – May. When ripe the fruit will fall from the tree. The tree has a 5m spread, 9m height and a flower type of A. An upright growing tree with glossy, green thick skinned & oval shaped fruit. The fruit matures September – December, and weighs approximately 400gms the tree has a 3m spread, 8 height and a flower type of B. A change of colour from green to purple (eg Hass). Fruit stem becomes yellow (eg Fuerte). A dull green shade may replace a shiny green appearance. If in doubt a sample can be picked and placed indoors. If the fruit ripens in a reasonable time, (7 – 10 days) without wilting, and shows all desirable characteristics of the variety, harvesting can start. Avocados are best clipped from the trees, rather then plucked, leaving a short portion of the corky stems. This helps prevent mould infection during ripening. Additional time and care spent in grading and packing this luxury fruit will be well rewarded on the market and in the home cupboard. I have found that picking is best done over the 20 weeks following the first ones being ready, while fruit could stay on tree for up to 18 months the fruit set for the following year is greatly effected if many fruit are on tree at the time of the next King Flower (this is the time in pollination where say 90% of flowers on a tree are in peak bloom and is the date in measuring flowering in fruit) so I suggest you count the fruit and divide by 20 and pick that many each week unless you want them to sell or trade at a market. themselves. Limbs, which cause overcrowding and are in poor shape, can be pinched back and the shoots arising from below the union/ graft should be removed. Match sets of 2-3 tree varieties in our southern climate to give 12 months of ripe fruit & not compromise pollination. Cool climate grafting as they need 26C and 80% humidity which is possible from the Murray River up, but in Melbourne when it gets hot enough the humidity drops too much. Normally a whip & tongue graft is used when the scion is green and actively growing in spring, but attempts here have seen the tops wither so I either have to build a “humidy crib” set up or we can use the approach graft method by placing the wanted variety in a pot adjacent to the rootstock, then you shave off a slice from each so they match and then bind then together with grafting tape, then when taken you can cut away and reuse the wanted variety. This method will also be the way to dual graft a tree in a backyard. See if home grown seedlings have any value as a rootstock in Melbourne for home gardeners: issue one will be tolerance to heavy soils, lime and salt. Issue two is the size of the eventual tree. It’s my opinion that growing pips at home in an urban yard is not worth the valuable space, I have seen these trees get to 6 mtrs after 8-10 years have one fruit then die, I would suggest the Fuerte would offer the best results for a home grown rootstock. Native of West Indies, Central and South America – tree are very sensitive to cold – skin of fruit is always smooth and leathery, seed is fairly large and loose in seed cavity and the two halves of the seed are rough on the surface, the fruit stems are short. UATEMALAN – Native of Central American highlands, much more resistant to cold, the new growth is a reddish bronze colour not green – skin of fruit is always thick and rough, the seed is small and tight in the cavity, each half is smooth and the fruit stem is long. Native of the Mexican highlands and mountain country running down as far as Chile. The leaves and young fruit of this race possess a characteristic aniseed, camphor odour when crushed, fruit is small with skin thin and smooth, and the seed is large and smooth. Most Australian commercial varieties are either Guatemalan or Mexican origin, or are hybrids of those two races. Since completing a PDC in 1995, Peter & Silvia, AKA Pete the Permie, have been building a Permaculture demonstration site on what was a 100 year old cut flower farm in Olinda, east of Melbourne. The 15 acre property now has over 1000 varieties of fruiting plants from apples to avocadoes and is home to milking sheep, goats and llama as well as rare breed poultry. From here they run PDCs and classes in cheese making, cider & fruit wines, heritage fruits, biodynamics, and units of the Diploma of Permaculture.